Huang-po (Huangbo Xiyun) (?-849) was an influential Chinese Zen Master, and the teacher of Lin-chi (Rinzai) during the Tang Dynasty. There is not much information about the life of Huang Po. However he taught in the tradition of Zen Buddhism. Huang Po taught that enlightenment could be achieved by a silent mind and putting an end to conceptual thinking. This is a similar teaching to other Zen Masters such as Bodidharma and Dogen. 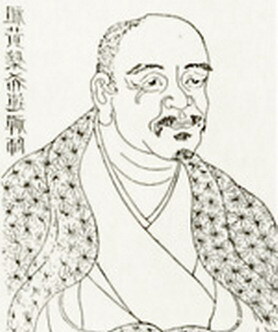 Huang Po was known for his unorthodox method of teaching, and would sometimes slap his students and question whether really anyone could be a teacher of Zen. On one occasion, Linji Yixuan was directed by the head monk, Muzhou Daoming, to question Huángbò on the meaning of Buddhism after Linji had been practicing in Huángbò’s monastery for three years without an interview. Three times Linji went to Huángbò and three times the only answer he got was a slap. “All Buddhas and all ordinary beings are nothing but the one mind. This mind is beginningless and endless, unborn and indestructible. It has no color or shape, neither exists nor doesn’t exist, isn’t old or new, long or short, large or small, since it transcends all measures, limits, names, and comparisons. It is what you see in front of you. From: Stephen Mitchell’s The Enlightened Mind – An Anthology of Sacred Prose, Harper Perennial, 1991.